Bradley Central's Rhyne Howard (23) shoots over Cleveland's Joy Douglass (22) in a game played at Raider Arena Tuesday evening. Howard's triple double of 28 points, 10 rebounds and 10 steals propelled the Bearettes to a crushing 73-22 defeat of their District 5-3A rival Lady raiders. The Cleveland boys defeated Bradley 60-55 in the nightcap. CLEVELAND, Tenn. – In a heated rivalry like Bradley Central and Cleveland have supersized over the years, emotions can, at times, reach the breaking point. That happened at Raider Arena on Tuesday night. In the girls’ game, easily won, 73-22, by the unbeaten and No. 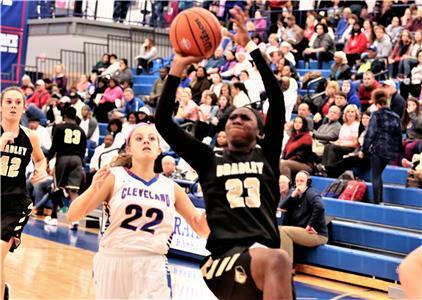 2-ranked Bearettes behind Kentucky signee Rhyne Howard’s triple-double – she played only 21 minutes – the hard-fought game even got heated on the sidelines. 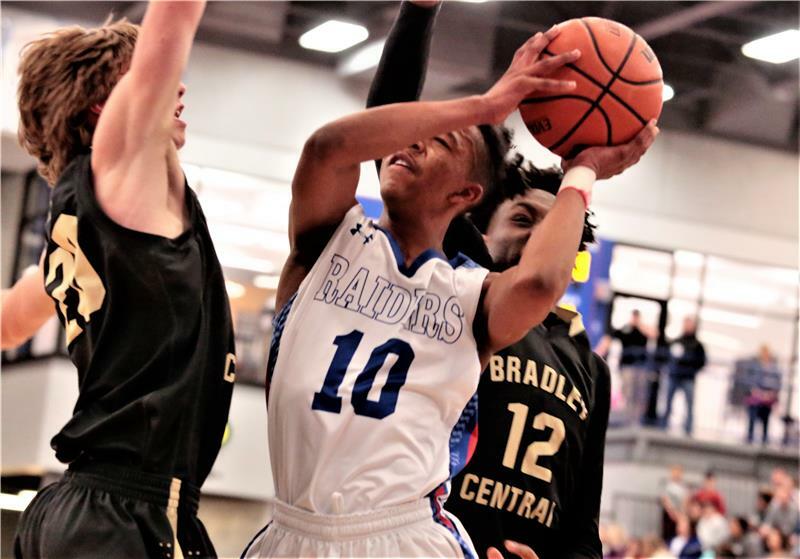 Later in the hotly contested boys’ game, the two teams waged an intensive battle and officials called four technical fouls and the Blue Raiders held on for a 60-55 victory to nail down a Region 3-3A tournament berth. Howard had 19 points at halftime and Cleveland shot an anemic seven percent and Bradley’s lead was 44-7 after Howard’s 3-pointer with 1.1 seconds on the clock in the District 5-3A contest. Cleveland coach Tony Williams shouted a vulgarity at Bradley coach Jason Reuter. Between the boys’ and girls’ game, Williams approached Reuter at one end of the gym, extended his right hand for a handshake. They shook and then spoke for 17 minutes. “What I said was uncalled for,” Williams said. “There’s a lot of emotional competitiveness out there and it got the best of me. We haven’t talked in two years and I thought tonight was a good night to bury the hatchet. So, I apologized. It was a frustrating game for us and I lashed out and didn’t do it in a healthy way. The two coaches previously had a run-in three years ago when Williams coached the girls’ team at East Hamilton. The feud simmered until Tuesday night when the temperature soared. Reuter is 18-1 against Cleveland while Williams has never beaten the Bearettes, including four times while with the Lady Blue Raiders. Bradley, the winningest team in TSSAA history for boys or girls, have now won seven straight in the series 19 of the last 20. Tuesday’s win pushed the Bearettes winning streak against district opponents, including district and region tournaments, has reached 49. Howard came into the game having scored 41, 38 and 39 points in three straight games, the best Bearette performance since Liz Hannah (Jackson) scored 42, 56 and 45 in successive games in 1974. Against the Lady Raiders, Howard went for 28 points, 10 rebounds and 10 steals and made 9 of 17 shots (3 for 7 on 3-pointers) and 7 for 7 at the free-throw line. Reuter, 223-28 in eight seasons at Bradley, emphasized Howard’s productivity despite sitting out 11 minutes. Junior Kaleigh Hughes ignited the Bearettes’ offensive fireworks, hitting a 3-pointer from the left wing 17 seconds into the opening quarter. Hughes also knocked down a 3 to start the second period. “The first one put a spark in me for the rest of the game,” said Hughes, who finished with 11 points on 4-for-5 shooting. The Bearettes (23-0, 10-0) extended their lead to 65-15 after three quarters and officials ordered a running clock in the final period. Bradley Central shot 49 percent from the floor and held the Lady Raiders (12-10, 5-4) to 15.6 percent. The Bearettes scored 35 points off 26 Cleveland turnovers, but hit only 17 of 28 free throws. The Blue Raiders started slowly, but regrouped and managed to take a 28-27 lead into halftime as Jacobi Wood scored half of the team’s 20 second-quarter points. Early in the fourth period, Cleveland’s Dionte Ware was slapped with a technical foul – his fifth personal and he missed the final six minutes – and Bradley had a chance to wipe out a 48-45 deficit. Trey Curry, Bradley’s promising freshman, made one free throw and Mason Rothwell, another prep rookie, hit two more. The Bearettes retained possession due to the technical, but turned the ball over. “That was a bonehead play (by Ware) and that happens in rivalry games,” Cleveland coach Jason McCowan said. “They got four free throws and the ball and that’s a long time on defense. Our four seniors did a good job by not losing their composure. We never panicked when we could have. Mullek Bradford tossed in two free throws and a minute later Deontae Davis drove the baseline for a superb finger roll layup and Cleveland had a 52-48 advantage. Curry, whose brother KK was a standout player at Cleveland until this season when he transferred to a private school in Connecticut, dropped in a free throw and hit a jumper from the left wing and the Bears were within 51-50. Senior Josh Black, who came off the bench when Ware fouled out, sandwiched two free throws and a layup around a Tyler Ferguson free throw and the Blue Raiders had a 57-52 lead. Wood paced Cleveland (17-3, 9-0) with 17 points and Davis finished with 15. Bradley’s Rothwell scored a game-high 19 points with four 3s and 12 points coming in the first half. Curry had 13 points and Lameric Tucker 10. The Bears are now 8-13 overall and 3-7 in the district. 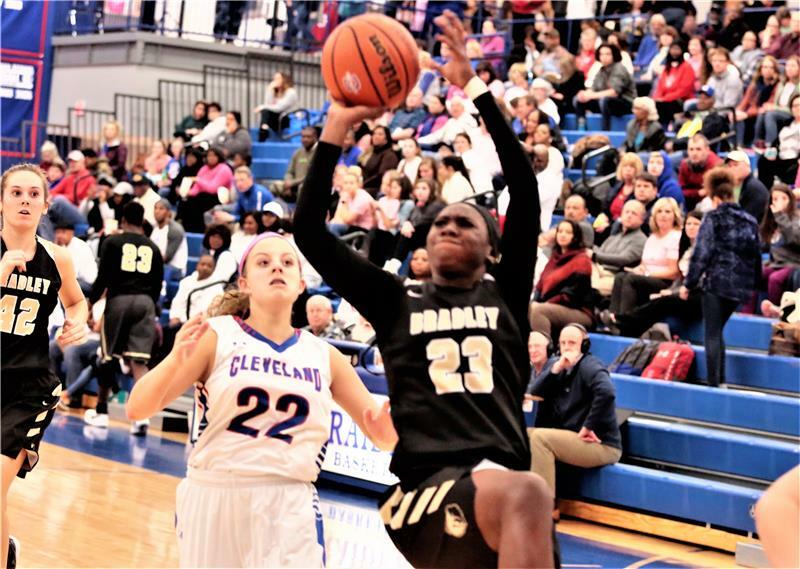 Bradley Central (73) – Kaleigh Hughes 11, Mayo 5, Rhyne Howard 28, Walker 6, Lombard, Williams 1, Roberts 4, Reuter 5, Blair 4, Barnes 9, Carman, Hullender, Muhonen. Cleveland (22) – Dasher, Williams 4, Flowers 4, Douglass 6, Anderson, Reed, Godman, Rominger, Franklin 3, Marshall, Rouse, Langford 4, Callahan, Droke 1, Alvared. 3-Point Goals – Bradley Central 8 (Hughes 3, Howard 3, Mayo 1, Reuter 1), Cleveland 1 (Williams 1). Bradley Central (55) – Boyd, Clark, Trey Curry 13, Lameric Tucker 10, Ferguson 6, Cobb 3, Elrod, Mason Rothwell 19, Greene 4. Cleveland (60) – Wykle 7, Bradford 7, Ware 9, Deontae Davis 15, , McGowan, Burke, Black 5. 3-Point Goals – Bradley Central 7 (Rothwell 4, Tucker 2, Greene 1), Cleveland 2 (Wood 1, Davis 1). Cleveland's JaKobi Wood (10) shoots in traffic against the Bradley Central defense. Wood's 17 points led the Blue Raiders to a 60-55 win over the Bears at Raider Arena Tuesday night in a District 5-3A contest.